South Cotabato 2nd District representative Daisy Avance-Fuentes continues to lead over Governor Arthur "Dodo" Y. Pingoy Jr. in the race for governorship of South Cotabato. As of 5:50 AM today May 15, 2013, Avance-Fuentes leads by 1,265 votes against Pingoy and more than 12,000 votes against Miguel. 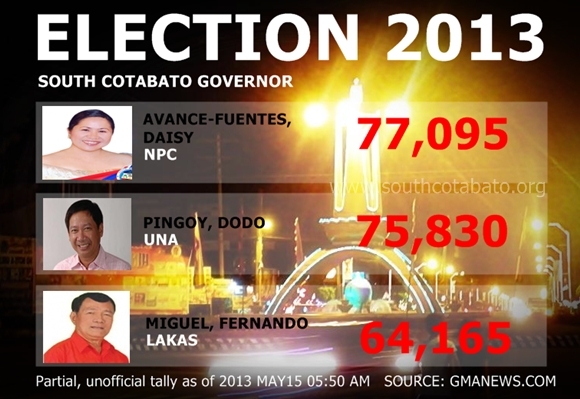 The data represents 43.78% of the South Cotabato Election Returns or 391 of 893 Election Returns and 233,507 of 669,432 Registered Voters in the province.